What Day Of The Week Was February 26? 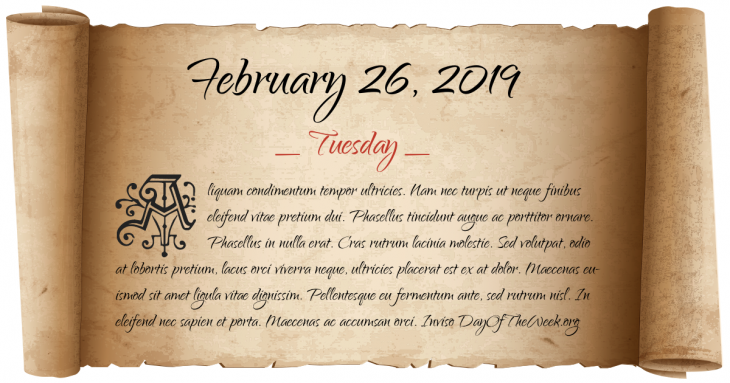 February 26, 2019 was the 57th day of the year 2019 in the Gregorian calendar. There were 308 days remaining until the end of the year. The day of the week was Tuesday. Battle of Benevento: An army led by Charles, Count of Anjou, defeats a combined German and Sicilian force led by King Manfred of Sicily. Manfred is killed in the battle and Pope Clement IV invests Charles as king of Sicily and Naples. Finnish observers report the first of many thousands of sightings of ghost rockets. A New York bound Alitalia airliner crashed into a cemetery at Shannon, Ireland, shortly after takeoff, killing 34 of the 52 persons on board. Gulf War: United States Army forces capture the town of Al Busayyah. Nagorno-Karabakh War: Khojaly Massacre: Armenian armed forces open fire on Azeri civilians at a military post outside the town of Khojaly leaving hundreds dead. The United Kingdom’s oldest investment banking institute, Barings Bank, collapses after a securities broker, Nick Leeson, loses $1.4 billion by speculating on the Singapore International Monetary Exchange using futures contracts. Who were born on February 26?